31 May 2016 Will Your Cell Phone Cause You to Develop Cancer? 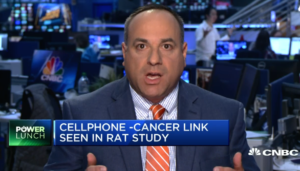 Last Friday, May 27, Jeff Stier, the Risk Analysis Director at the National Center for Public Policy Research, appeared on CNBC to discuss a new NIH study regarding the link between cell phones and cancer in rats. These studies are animal studies, high-dose long-term exposure. Nobody’s exposed to that much cell phone that long at the human equivalent of the rats. This study is more junk science. It’s not relevant to our everyday lives. I have no quibble with the study, by the way. It’s true. And I’m going to keep my male rats away from cell phones. But it’s not relevant to us. An excerpt of Jeff’s appearance on CNBC’s “Power Lunch” can be seen below, after the ad.